He drove in eleven Formula One Grand Prix races between 1952 and 1956, the era when the cars and tracks were so dangerous that just surviving from one season to the next was a victory. Teamed with fellow Belgian Olivier Gendebien, he won the 24 Hours of Le Mans in a Ferrari in 1960. He had an influence on three generations of automotive writers and, along with other luminaries like Ken Purdy, Denis Jenkinson and David E Davis, Jr defined both the role and the style that would come to represent the prototypical automotive journalist. He was Paul Frère and he died in 2009 at the age of 91. Most writers have heroes. Extraordinary talented artists like Ernest Hemingway, F Scott Fitzgerald, Shelby Foote, Raymond Chandler, or Farley Mowat whose works strike a chord and resonate with us lesser mortals who are trying to forge a living out of the practice of putting words to paper. Likewise, racing drivers also have their heroes. Many admire drivers from the past like A.J. Foyt, Parnelli Jones or Fireball Roberts who drove like bulls in a china shop and could grab any racecar by its neck and wrestle it to the ground. While this hard-nosed image of the all-American racer has its charms, some prefer the artistry and limitless talent of a Jim Clark or Juan Manuel Fangio; those drivers who could drift a racing car through a corner at 150 mph with all of the grace and finesse of a ballet dancer. 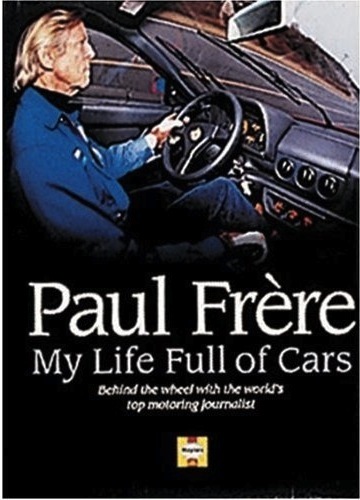 Writers and racers had their favorites, but if you are a writer who happens to love motor racing, you have one special hero: Paul Frère. 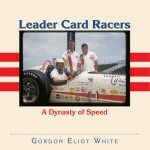 In 2000 he created an autobiography about the cars in his life—racing and otherwise, and what they meant to him. Frére was born in Le Harve, France on January 30, 1917. His father was a Belgian diplomat and as Paul grew up, the family lived in many of Europe’s capitals, no doubt a reason for Paul Frère’s renowned air of sophistication and polish. He was educated in Brussels as a commercial engineer, but in 1946 discovered motorsports, winning his class in the first motorcycle race he entered on a prewar 500-cc Triumph twin. Two years later he switched to automobiles and he entered the 24-Hour Race at Spa Francorchamps in Belgium in a 1938 ex-Le Mans MG PB Special. In 1950, he won his class in that race in an 850-cc Dyna Panhard and repeated the performance in 1951. 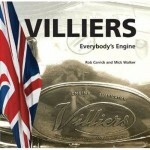 In his book Frère tells us the story that in the early 1950’s, he was working as the service manager for Belgium’s Jaguar importer when a customer who had entered his sports car in a race at the Spa circuit came to the service department and complained that his car wasn’t quick enough. Frère, the service manager took the car out onto the circuit and in 3 laps put in the fastest qualifying time of the day. In 1952 Frère made his Formula One debut at the Belgium circuit and made five starts that season. He never ran a full Grand Prix season and his best results were 4th in 1955 and 2nd in 1956, both results racing at the Spa circuit and both times driving for Ferrari. Frère could drive just about anything, witness his first overall at the Spa 24-hour race in 1952 in an Oldsmobile Rocket 88 and his class win at the 1953 Mille Miglia in Italy driving a 1953 Chrysler Saratoga Coupe. And yet, throughout his autobiography, he never brags about his accomplishments, preferring instead to give us insights behind the headlines and telling us the real story. Long Distance events were a specialty for Frère; he raced eight times at the 24 Hours of Le Mans, finishing six of those races. In 1955 he was 2nd overall, driving with Peter Collins in an Aston Martin DB3S. In 1957, he was 4th overall in a Jaguar D-Type with fellow Belgian Freddy Rousselle and in 1958 he got another 4th overall with Edgar Barth in a Porsche RSK. He was on the podium in 1959, driving with Maurice Trintingent in an Aston Martin DBR1. He and Olivier Gendebien won the event in 1960 in a Ferrari after leading for 22 hours. 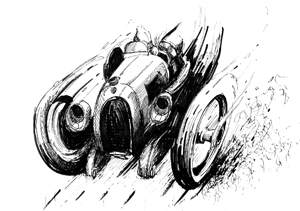 It is noteworthy that each of the drivers that he was paired with over these years was a top-ranked sport scar racer; Frère was never merely journalist baggage, but a real racer with proven abilities to race with the big boys. To top off his season in 1960, he also won the non-championship South African Grand Prix, driving a Cooper Formula One machine. Frère retired from racing after that year at the age of 43 and pursued his career as an automotive journalist and writer. We are lucky that he did so. In 1963 he wrote Sports Car and Competition Driving, a slim 156 page book that sold tens of thousands of copies and that was the starting point for thousands of would-be racers. It has been updated, republished and remains in print to this day as one on the best how-to books about driving a car in competition. Around his time he also developed a relationship with Road & Trackmagazine as its European Editor, a position he kept for the rest of his life. AsR&T’s eyes and ears in Europe, Frère was a person that American enthusiasts could trust to give clear mechanical analyses and insightful driving impressions. Those of us who grew up reading his stories felt that we had a friend in a high place within the European auto industry. His later books were often about Porsches, including The Porsche 911 Story the seminal work on those iconoclastic automobiles. Frère maintained his connections with the 24-Hour Race at Le Mans. It became a tradition that his would always be the first question at the first race press conference each year. In 2001 he was awarded the “Spirit of Le Mans” award and in 2003, just before the start of the race, at the age of 86, he jumped aboard an Audi R8 race car and in three laps came within 20 seconds of the team driver’s best qualifying times. Paul Frère was the real deal. He could not only compete at the highest levels of the sport, he put his name on the rarified list. He always was exactly what you would expect: cordial, polite, impeccably dressed, witty and full of life. What more could you want from a hero?